← Why choose Express Medical? When you child comes down with the flu, it can be a miserable time for everyone. If you are like most parents, you hate seeing your child sick. It makes you feel helpless. Also, when a child is sick, they are whiny and miserable. The main goal of a parent of a sick child is to get them feeling better as soon as possible. One way to do this is to keep your child hydrated. 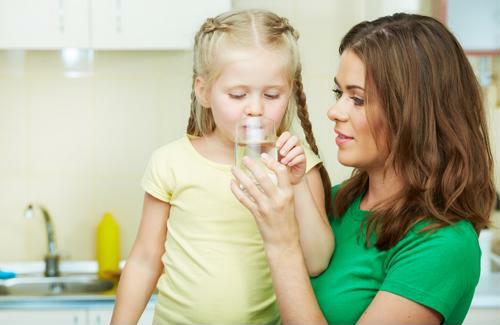 Unfortunately, it can be difficult to get your child to drink enough when they are sick. Sometimes, you need to get creative to get your sick child to stay hydrated. Most kids love fruit juice, therefore, it is a good choice. Unfortunately, most fruit juices on the market are loaded with sugar, which isn’t the best when your child is sick. If you are going to give you child fruit juice, you should dilute it with water. The types of juice that will be most soothing to your child are grape juice and apple juice. Pedialyte is one of the best fluids to give your child when they are sick. This is because Pedialyte will replace all of the electrolytes that you child loses when they are sick. Pedialyte comes in a variety of flavors, therefore, it shouldn’t be too difficult to find on that your child will like. Water is the purest and most efficient way to hydrate your child. Unfortunately, most kids don’t like water. It is boring and it has no taste. It is very easy to liven up with a packet of flavoring. You can buy a variety of flavor packets that you can pour right into the water bottle, making it a convenient and tasty option. This entry was posted in Flu Vaccine, Health and tagged 2016-2017 flu, 2016-2017 flu season, 2016-2017 flu vaccines, AIDS, annual flu, Annual flu shot, annual flu vaccination, annual flu vaccine, antihistamine, antioxidants, antiviral medication, arthritis, Asthma, avoid the flu, avoid the flu virus, avoiding influenza, bacterial infection, becoming ill, benefits of a flu vaccine, Blood Pressure, body aches, body temperatures, book flu vaccine, book flu vaccines, book your flu vaccine, buy flu vaccine, call a doctor, chills, chronic lung disease, chronic medical, Cold, Cold season, complications, compromised immune system, Contagious, Contamination, coughing, decongestants, Decongestion, Diabetes, diphtheria, doctor, Dry chesty cough, Ear Infections, eating healthy, eliminate stress, Exercise, express, express medical, express-medical-supplies, expressmedical, expressmedicalsupplies, fatigue, fever, flu, flu activity, flu mist, flu pre book, flu prebook, flu prebooking, flu prevention, flu season, flu shot, flu shots, flu spreads, flu symptom, flu symptoms, Flu treatment, flu vaccine, Flu Vaccines, flu virus, flumist, flumist nasal spray, get rid of the flu, Hand-Washing, headaches, health, Heart Disease, High Contamination, high risk, high-risk conditions, HIV, home treatment, hospital, hospitalization, Household, how the flu spreads, Hygiene, ill, illness, immune system, immunity, immunization, immunized against influenza, inactivated flu virus, infected, infection, Infections, infectious, infectious viral illness, Inflammatory, influenza, influenza prevention, influenza virus, influzena, lungs, medical, medicine, nasal passage, nasal passageways, nasal spray, nasal spray decongestants, oral forms, passageways, Pediatricians, pneumonia, postnasal drip, pre book, pre book flu vaccines, pre book your flu vaccine, prebook, prebook flu, prebook flu shot, Prebook Flu Vaccine, prebook flu vaccines, prebook vaccine, prebook your flu vaccines, prebooking, prebooking flu, prebooking your flu vaccine, preventing the flu, protect, protect against the flu, protecting, protection against the flu virus, pseudo-illness, rheumatoid arthritis, running nose, runny eyes, seasonal flu, seasonal influenza, sick, Sick Room, sickness, sinus, sneezing, sore throat, spread of flu, spread of flu germs, spread of influenza, spread of the flu virus, spreading the flu, spreading the flu virus, stay healthy, stay healthy this flu season, symptoms, temperatures, Throat, tissues, treatment, types of flu, understanding flu, Vaccinated, vaccinations, Vaccine, Viral infections, virus, Washing Your Hands. Bookmark the permalink.